Since its debut in 1994, Mike Mignola's Hellboy has been one of the most celebrated comics on the shelves. Mignola has won every major industry award for his work, and attracted the attention of Hollywood for a series of jobs on high-profile films, including Disney's Atlantis and Francis Ford Coppola's Dracula. Now the director he teamed with on Blade II, Guillermo del Toro, brings Mignola's creation to the big screen, and Dark Horse provides a unique look into this moment in comics-to-film history. 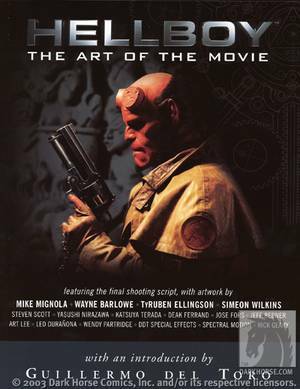 This 200-page book features del Toro's complete screenplay, based on Mignola's Hellboy: Seed of Destruction, production art by Mignola, Wayne Barlowe (Barlowe's Guide to Extraterrestrials, Harry Potter and the Prisoner of Azkaban (Book 3), and Ty Ellingson (Jurassic Park, Star Wars: A New Hope, The Special Edition), as well as commentary by Mignola and excerpts from del Toro's on-set diary.